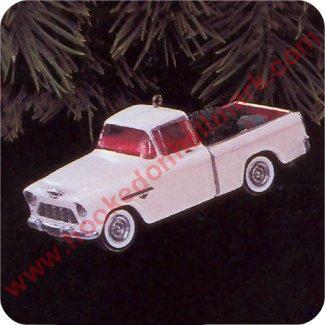 The 1955 Chevrolet Cameo is the second truck featured in the Hallmark Keepsake Ornament series - All American Trucks. The front license plate is dated 1955, the back plate on the Hallmark ornament is dated 1996. This Hallmark All American Truck ornament is handcrafted and the wheels turn.